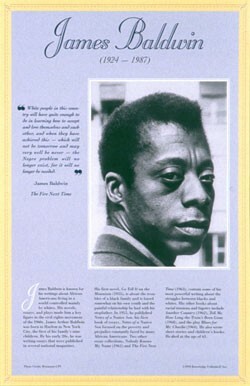 This unique educational poster of writer James Baldwin features a striking photo of him, as well as a quote from "The Fire Next Time," and concise biographical text summarizing his life and career. 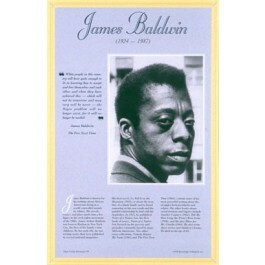 James Baldwin is known for his writings about African Americans living in a world controlled mainly by whites. His novels, essays, and plays made him a key figure in the civil rights movement. His first novel, "Go Tell It on the Mountain," was based on his own painful relationship with his stepfather. This poster is a great way to introduce students to this important 20th century American writer.